1800Pocket/PC isn’t only about articles for me. When I took over the website over a year ago, I also took it upon myself to revamp the longstanding mobile application as well. While it was certainly usable in many ways, the app was in great need of an update and still had Windows Phone 7 all over it. While the app was updated once in 2014 in order to bring it up to speed, it was still absent from the Windows PC and tablet and existed as a mobile-only experience. This changed with the launch of the Universal Windows version back in May of this year. I’m very new to application development, but that hasn’t stopped me from trying to improve the experience. Many of you sent feedback via email with suggestions on improving the application. I’ve taken all of these suggestions to heart and did my best to implement them in the new Windows 10 application, which was released this past week. The new Windows 10 experience incorporates a completely revamped design (though some elements of the old Windows 8.1 / Windows Phone 8.1 version still exist). I’ve changed the icons around, rearranged certain sections, and yes, there are no ads in this initial version, which retains its free download price. There’s a lot that’s new in the Windows 10 app, but the most notable change is the addition of video support, as you can see in the PC screenshot above. Many of our articles include videos and an unfortunate problem with the 8.1 app was the inability to view videos unless you viewed the mobile website. This new update fixes the problem and allows you to view videos from within the application itself. The articles themselves have been designed to give the app a little more of a “magazine” type of feel while maintaining simple readability. I’m thinking about changing the background color to white and font color from green to black in a future update to reflect the website’s look and feel. Whether you’re on a mobile device or a high-end PC, I’ve done my best to optimize the app to work much quicker than the 8.1 version, which took a little longer to load images than I liked. Each of the app sections is also accessible via one click on the sidebar as you can see in many of the screenshots. To see the names of each section, simply tap or click on the menu button in the top left. Now for what’s still being worked on. First, the live tile. The new update features a large box tile size that wasn’t found in the 8.1 app, but I’m still working on making the tile “live.” Right now, it just shows the static 1800PPC logo, but it will show article images in the future. Notifications for news apps are not found in most news apps on the Windows platform, but I’d like to at least give you all the option if you choose to have notifications. With comments, I’d like to fully integrate them into the app as well, but we’re currently deciding ultimately what we’re going to do with the comments section on the website, so it was omitted for the time being. 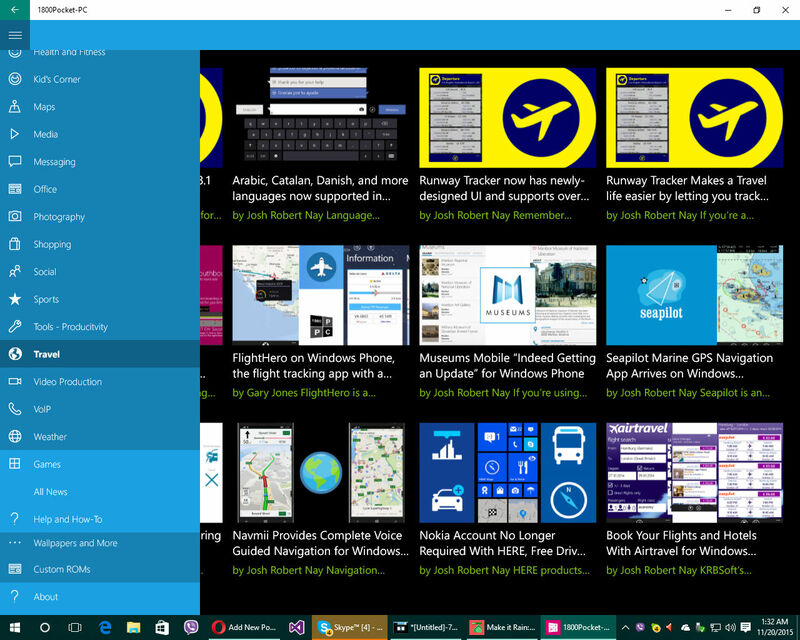 Last but not least, I’d also like to integrate some Cortana functionality as well. As always, I’m open to feedback and if you’d like to pitch in and help with the application’s further development, please contact me and we can work something out. 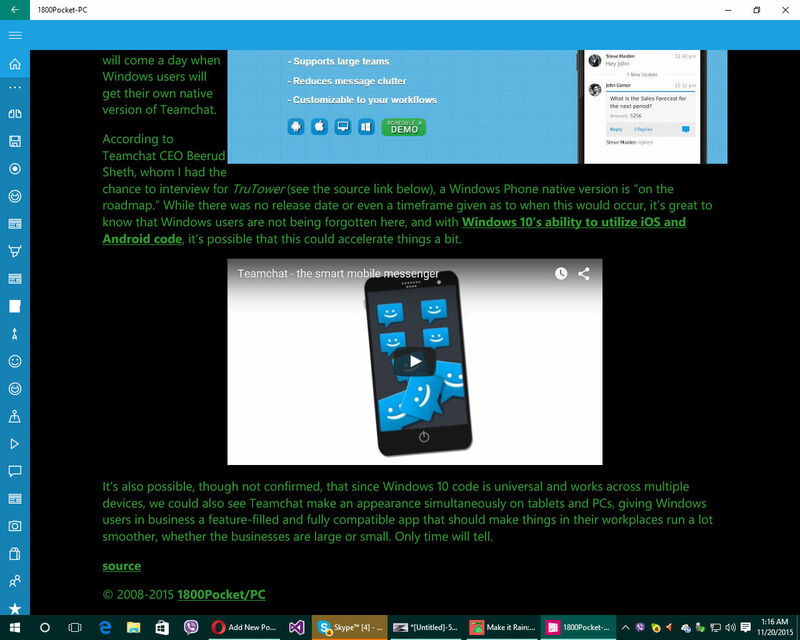 Download the new Windows 10 application below and please support us with a five star rating!